It all began during Museumnacht 010, a night of special events at Rotterdam museums, when I spotted something out of the ordinary in the park by the Kunsthal and the Natural History Museum: a public jukebox! And not just any old jukebox, but one offering a menu of choices that included “Global Warming Warning: Sound of insects during warm summer night” at No. 37, “Did You Really Mean It: Message from Ronald Reagan” (No. 55), “Natural Antidepressant: Stravinsky’s Pulcinella” (No. 59), “Call of Duty: Richard Wagner’s Ride of the Valkyries” (No. 61), “This Guy Was an Immigrant Too: Chopin’s Revolutionary Etude. Everybody loves it.” (No. 64), and “My Favorite Song: David Bowie Space Oddity” at No. 81, among many others. Ground Control to Major Tom/Take your protein pills/and put your helmet on. A couple of weeks went by before I finally connected the Public Jukebox to the Kunsthal, and specifically, to the name of the Czech artist Krištof Kintera and the exhibition Your Light Is My Light. Kintera’s work is unsettling and disturbing. Even the normally simple act of entering the exhibition space was made disorienting. I found my way to the small balcony overlooking the main exhibition space before heading for the larger space only to find myself thoroughly confused, walking down a narrow corridor of bright yellow walls. I could hear the exhibition–as the video suggests, it is not a quiet one–but I could not find my way into the space. When I finally arrived at the entrance, the first thing I encountered was a talking shopping bag with a cucumber periscope swiveling in all directions! Glancing the other way, I saw something that anyone who has grown up in the snowy north recognizes right away, a pile of dirty snow thrown up by the roadside in early spring. Not the real thing, of course, but one so convincing that the mind spins at the thought of such attention to detail in the medium of epoxy, styrofoam, salt and paint. In many cultures, the raven […] has a symbolic meaning; it is a divine creature that is often used to symbolise a prophet. Kintera has the bird shouting out visionary, trivial slogans such as ‘Just do it!’ and ‘Let’s make things better’ as philosophical insights. When taken out of their context, these well-established yet trivial catchphrases do indeed take on an almost metaphysical quality. Under the gaze of the raven, the Nervous Trees quivered and shifted about on their twig legs, the Talkmen told stories, asked questions, and made comments as soon as anyone approached them. Somewhere there was a loud banging noise. Perhaps the most impressive intervention was a huge sculpture of old lamps and cables, My Light is Your Life, which lit up the room when the overhead lights dimmed to the strains of a Czech song broadcast from a megaphone apparently discarded on the floor. Things took an even darker turn outside the main exhibition space. The source of the intermittent loud banging turned out to be a Talkman erratically banging his head against a wall at the bottom of the stairs leading to the emergency exit, a space not normally given over to exhibitions. According to the catalogue, this work expresses the frustration felt when Czechoslovakia was divided into the Czech Republic and Slovakia in 1993. Kintera was born in 1973, five years after the Prague Spring. He was sixteen at the time of the Velvet Revolution and twenty at the time of the split. It is not difficult to see the inspiration for the little man banging his head against the wall. 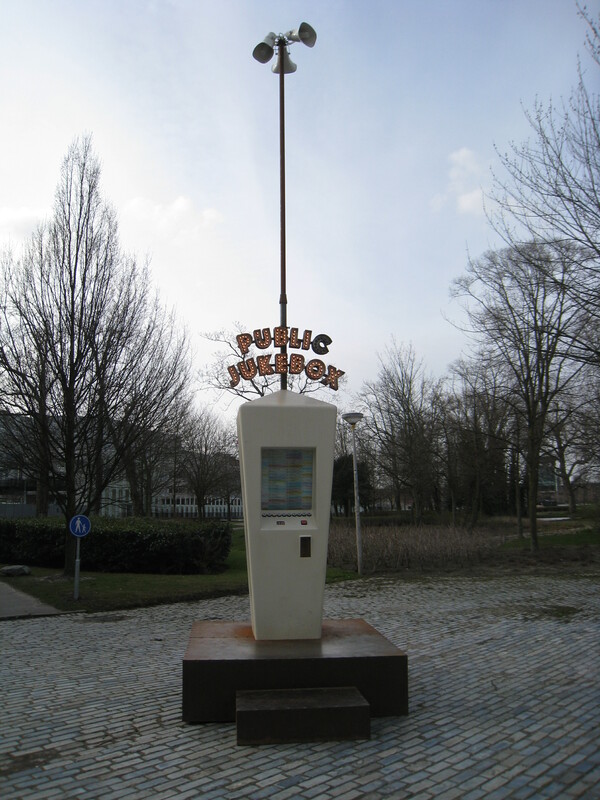 But Kintera saved the worst for last: Bad News was installed in a Cold War bunker on the Westzeedijk, a minute across the lawns from the Kunsthal building. The bunker is a small, smelly concrete rectangle dug into the dyke, usually firmly locked up behind two steel doors, but on this occasion, the space was occupied by a monstrous and noisy creation that made you think of the end of days. Hi Mark, Sure he has a sense of humour–otherwise the exhibition would never have attracted as many people as it did–but there was a sharp sting in the tail. Thanks for sharing the beautiful photos. Industrial decay is one of my favorite themes!